Hand Crafted Recycled Metal Rustic Sculpture Mexico, "Rustic Accountant"
Bent over his desk, an accountant punches numbers into an old-fashioned adding machine. Armando Ramírez creates the dedicated professional in a rustic sculpture. It is handcrafted of recycled metal, with a spark plug for the body. You can find recycled metal sculpture 'Rustic Accountant' by Armando Ramirez in sculpture categories such as Recycled Metal Sculpture, Eco-Friendly Sculpture and Metal Sculpture. Enjoy exploring these sections for other Novica treasures. I had bought other pieces from this artist as gifts. Thankfully my brother snuck on here and got this for me as a gift as I work in an accountants office. Loves this piece and have gotten numerous positive comments. I have it on my desk at the office and the tape you see running off the calculator is perfect to hold business cards, which is the exact size of the desk. Quick shipping and very good packaging. High quality metal sculpture. I would buy again and would recommend this to a friend. 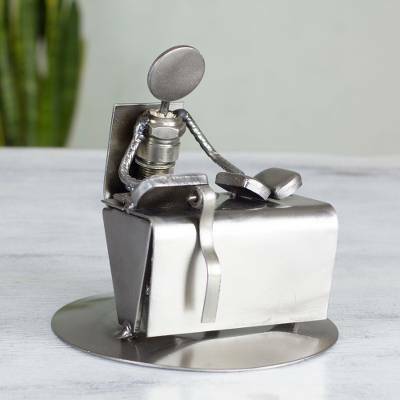 "For my hardworking father in law"
An awesome desk top statue. My father in law has a little bit of everything making him hard to shop for. He loved this gift, it sits next to him on his desk. We'll constructed! "My Tax Guy Hard at Work "
I was hunting for a little unique gift for my Tax Man and friend. This was perfect to show my appreciation. He loved it. "Great Gift For An Accountant"
Armando's work is unique and amazing.